An agreement to advocate for better passenger rail service throughout the Midwest would continue under a bill heard by the Transportation and Telecommunications Committee Jan. 23. Nebraska is a founding member of the Midwest Interstate Passenger Rail Compact, which promotes, coordinates and supports improvements to passenger rail service among its nine member states. The Legislature passed LB317 in 2015 to end Nebraska’s membership on June 30, 2018, due to concerns over the cost of membership. 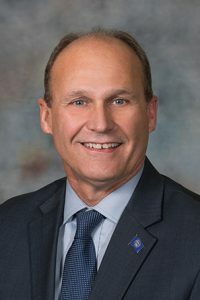 LB769, introduced by Grand Island Sen. Dan Quick, would allow the state’s membership in the Compact to continue indefinitely. Quick said prospective employers looking to locate in Nebraska are concerned with the availability of public transportation. Remaining a member would provide valuable information, knowledge and motivation to advocate for greater passenger rail service, he said, which in turn would spur greater economic development. The bill also would establish a cash fund to pay for the biennial $15,000 membership dues. The fund could accept gifts, grants or bequests from public or private sources to cover the cost of membership. Beth McCluskey of Illinois, chairperson of the MIPRC, spoke in support of the proposal. She said that even with limited service currently available in Nebraska, the economic impact of Amtrak’s investments in the state has grown exponentially in the last 10 years. Also supporting the bill was Matthew Roque, president of ProRail Nebraska. Membership in the compact allows Nebraska to collaborate with states that have similar passenger rail needs, he said.